Perspective is an interesting thing. My girls and I saw these little bark-like cocoons growing on several of our trees. Wondering what was growing inside, and having a respect for life, we decided to leave them alone and wait and see what would emerge with growing excitement. A few weeks ago, I had a tree expert come to my property to talk to me about a few of my trees when he noticed this interesting sack and said, "See this? 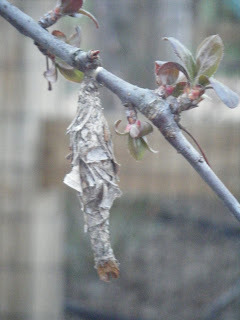 This is a bagworm. It will kill your entire tree. You need to remove these and get rid of them every season as winter turns into spring." So, what at first seemed like a promise of a gift of some beautiful butterfly, is now the fear of saving my trees and so my girls and husband removed scads and scads of them from our trees over the weekend. What once made me think of beauty, now makes me feel disgusted. A shift in perspecitve. And so, that brings us to my present situation... I am going in to teach a demo lesson to a 4th grade class for a possible teaching position at an all-girls school. I thought I would teach a lesson on shifting perspectives in literature. I would present well-known stories in a sentence or two, told by a secondary character's POV. Then I would have them take a story of their choosing and shift the perspective by telling it in a few sentences from a secondary character's POV, thereby shifting the story's perspective. So what do you all think? Have any comments or suggestions? Any ideas pop into your head??? Neat idea, Sheri. How about telling some from the antagonist's POV. Like they always say, history is written by the winners. The True Story of the Three Little Pigs is told from the wolf's perspective and would be very funny for 4th graders. Might be a good way to introduce the lesson. I think this is a great activity for kids, not only in their writing, but in life. Putting themselves in someone else's shoes. Good luck with it, and let us know how it goes! Dawn LOL I had it in my bag, but we ran out of time. I LOVE that story and use it all the time for pespective.